Boxes are quality-made with plated locking hardware and steel core and have vinyl cushioned handles. 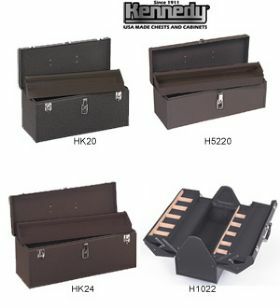 HK20and HK24trays have socket set divider. H5220has a lift-out tray. H1022has a divider for storing socket sets and movable/removable partitions and divider sets that permit you to create six compartments in each of two trays. FOB Shipping Point.